One Wild and Crazy Guy: Image courtesy of Audible, Inc. 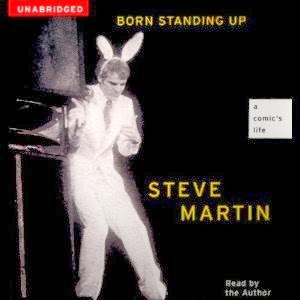 Here's the honest truth - I never really thought much of Steve Martin until about five years ago when I picked up his novel, Shopgirl. To me, he was just the goofball in feel-good comedies like Father of the Bride and that "wild and crazy guy" hanging out with Dan Aykroyd in the beloved bygone golden years of Saturday Night Live. I was so floored by the delicate beauty that is present within the writing, effectively cloaking the core strength of the main character, Mirabelle, until the time is right. It shows the kind of despairing beauty that is Los Angeles, and the oft-seen but seldom discussed phenomenon of the significantly older man/younger woman relationship that blooms in the desert of loneliness and is so often doomed to fail by the harsh rays of reality. I kept flipping back to the cover and thinking, wow, STEVE MARTIN wrote this? And that was when I began to see Martin, whose humor as a child/teen I never quite got, as someone very different than the image I had formed in my head of the prematurely white-haired buffoon. In Born Standing Up, Martin takes his wry humor and turns it in on himself without being self-indulgent. Listening to the author relate his own words, cracking his own jokes, creates the sense that the story is being told just for you. Punctuated by banjo solos composed by Martin himself, the story of his evolution into the actor/musician he is today is a strange brew of concise and expansive, honest and circumspect. This is no "Steve Martin unplugged", no tearful confessions, no rants of the pressures of being a star. Indeed, at just a touch over four hours, it is a quick read/listen, and yet no less satisfying for the journey it takes you on. There's a part of the book where Martin confesses that he's never been very good at acknowledging his fame with others; people expect him to be the off-beat, wacky guy that they see when he's off the stage or screen, when in reality, he is rather reserved. This made me recall a great story Rich, my dear friend from college, told me about spotting Martin in a quiet wing of the Metropolitan Museum of Art in New York City a few years ago. He was wearing a black ball cap low over his face. Rich politely approached him, and said, "Excuse me. Are you Steve Martin?" Whereupon with a certain amount of dread, Martin turned his eyes to him and said warily, "Yeeesss..." To which Rich said, with the kind of affable charm that I can so easily envision thanks to our 10+ years of friendship, "Okay, cool. Have a great day!" and left him alone. While I doubt that I will ever have an opportunity to meet Martin, or that he would even be pleased to make my acquaintance, I cannot help but admire the astonishingly wonderful writing that comes out of this contemplative, banjo-strumming fellow - the man he is when he puts "The Jerk" and "The Wild and Crazy Guy" on the shelf. Thanks Steve, for finding a way to show us the thoughtful guy behind the funny face. Toby Sez: Author's voice and banjo riffs add depth and charm to this concise and honest tale of one man's road towards comedic success.